Euphyllia cristata Chevalier 1971, Grape Coral. Colonies of 1-2 inch diameter. 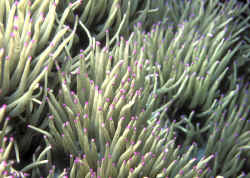 Large, circular polyp tentacles with round to flattened knobbed ends. Below: two pix in aquariums and one in N. Sulawesi. Euphyllia divisa Veron & Pichon 1980, Frogspawn Coral. Characterized by tubular tentacles with branchings and knob-like ends. At right, green colony, a one meter one in Malaysia and three aquarium close-ups below.